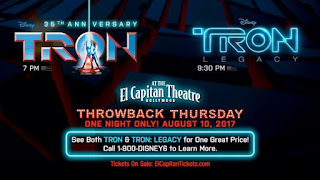 We may never get another sequel to Tron, thanks Star Wars, but we can still love the two we got. 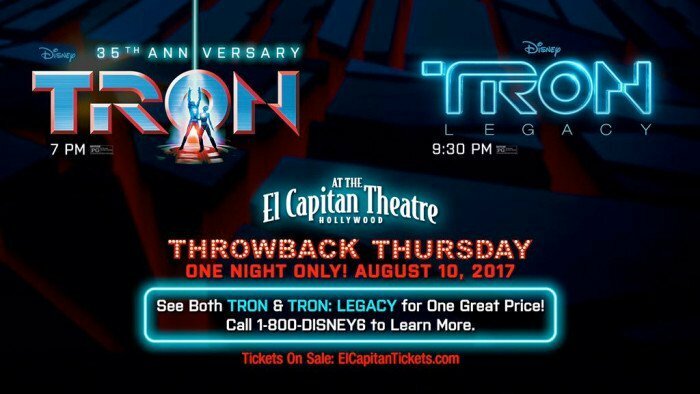 We're getting a double feature at the El Capitan Theatre of Tron and Tron Legacy Aug 10. Special Double Feature VIP Preferred Tickets are just $15.00 for both screenings, which include VIP Preferred Seat, 64 oz. El Capitan Theatre souvenir Popcorn Bucket with Lid and 20 oz. twist top bottle of choice. To see a Single Movie, Reserved Tickets are $10, which include Reserved Seat, 39 oz. Popcorn Box and 12 oz twist top beverage bottle of choice.